Even if you keep your air conditioner in tip-top shape, it won’t last forever. Whether a component has broken or the system is worn out from years of use, there will come a time when you might wonder whether your system is worth repairing. 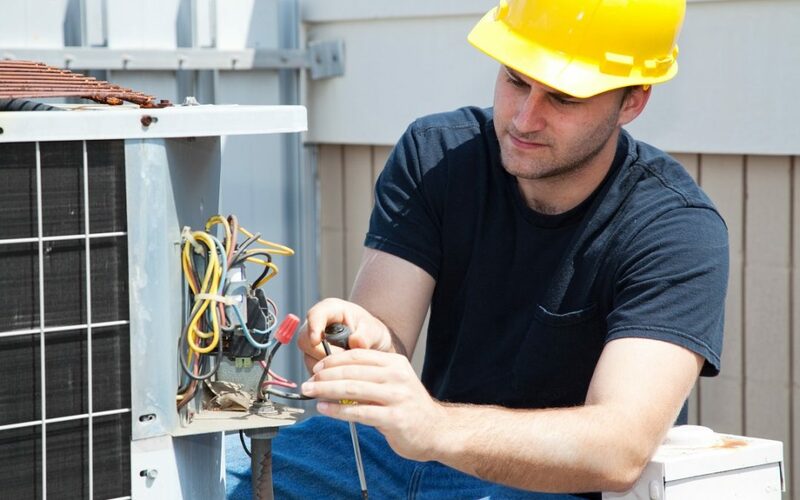 It’s easy to opt for small repairs rather than purchasing new commercial air conditioning, but those quick fixes will add up over the long run and may cost your company severely in the long-run. So how should you decide between repair and replacement? Here are a few indicators that’ll help you make your choice. As air conditioners get older, they tend to lose efficiency. Inefficient systems will take longer to cool your building, resulting in higher costs for your business. You might also notice warm spots when walking through a room. These are signs that it might be time to consider buying a replacement air conditioning system. Commercial air conditioners are built to last upwards of ten to fifteen years. Having an older system doesn’t automatically mean it needs to be replaced, but if you find yourself needing a repair, you might want to consider a replacement. A replacement might mean more cost up front, but it will save you from the many repairs you’ll require as your system gets older. If you find yourself calling for repair services more often than you used to, it could be a sign that your system is due for replacing. If you find yourself in need of repairs more than a couple of times a year, it’s time to bring in a system that won’t let you down. A functioning cooling system will filter pollen, dust, and humidity from the air. A working filter is especially important for air conditioners in Sydney as the weather warms up. If you notice a drop in interior air quality, it might be due to an inefficient system. Does your air conditioning system make strange sounds or noticeable noise? If the answer is yes, it’s likely time for a replacement. When your air conditioning system is running effectively, you should barely notice its presence. Sounds like squeaking, rattling, and grinding can indicate serious problems with your system, so don’t wait to call an air conditioning technician to investigate. Old and inefficient air conditioners in Sydney and around Australia can cause unfortunate consequences for your office, shopping centre, or commercial building. If you wait too long to replace your air conditioner, it’s likely you’ll need repairs several times a year. Even if these fixes are small, repair bills can add up quickly and cost you more in the long run than an air conditioner replacement. An inefficient air conditioning system can cost you in more ways than one. Old or broken systems can’t cool as efficiently as new systems, which can make your energy bill skyrocket. With a new, efficient commercial system, you’ll enjoy a drop in your energy bills and an increase in your comfort. With summer just around the corner, air conditioners in Sydney need to be at their best. Avoiding an air conditioner replacement can mean pollen, dust, and humidity in the air. Whether you run an office, shopping centre, or warehouse, a new air conditioning system will make life cooler this summer for your employees and customers. If you suspect your air conditioner could do with replacement, Apex can help. As leading experts in the heating and cooling industry, we can help get your cooling system back on track quickly, whether you need repairs or replacement. Our fully trained technicians provide efficient service when you need it and can answer any questions you might have. Contact Apex Airconditioning today to learn more about how we can help you with your air conditioning unit.